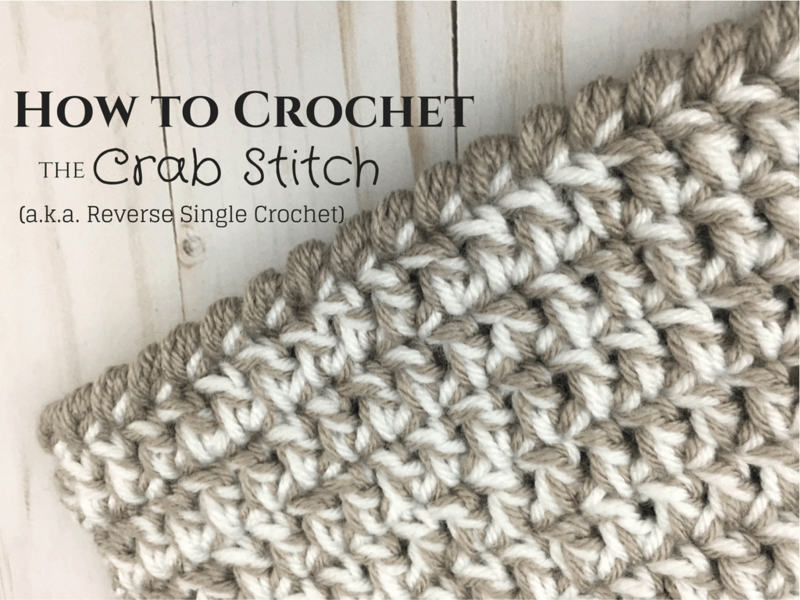 What is the crab stitch you ask? Only the easiest crochet border stitch ever. I tend to only use this for a border in crochet because of the way it works up. 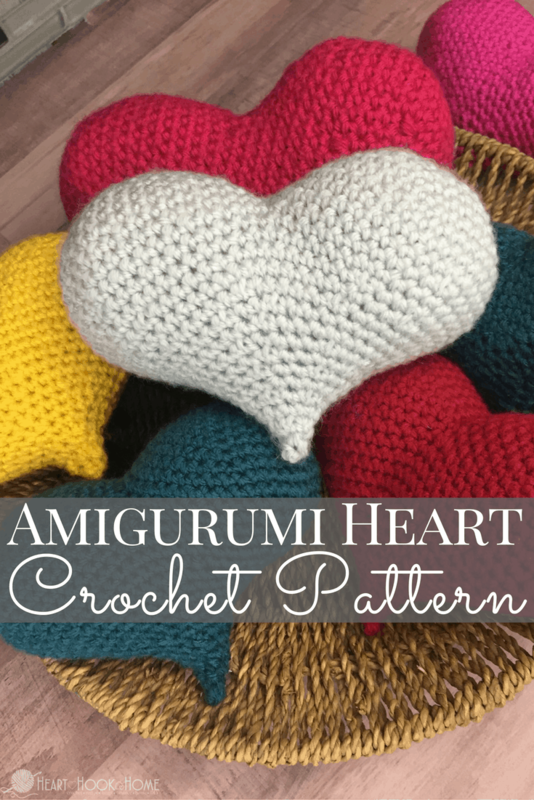 While it is not easy to go back through and continue crocheting after this stitch, it does make for a beautiful edge on baby blankets, big blankets, hats… anything to which you would normally add a border. 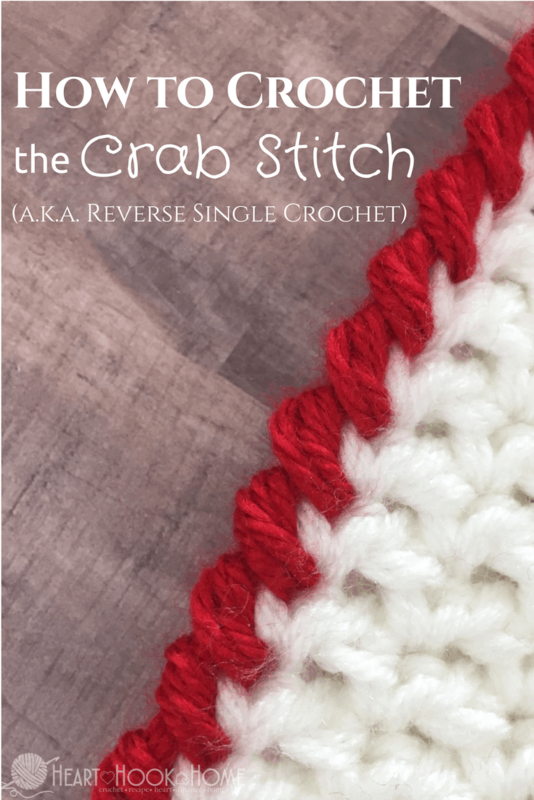 The crab stitch (a.k.a. reverse single crochet) is literally the single crochet stitch done in reverse. Instead of working as you normally would (right to left) you are working left to right. For right handed crocheters, that is. Ready for the video tutorial? Written instructions are given below. 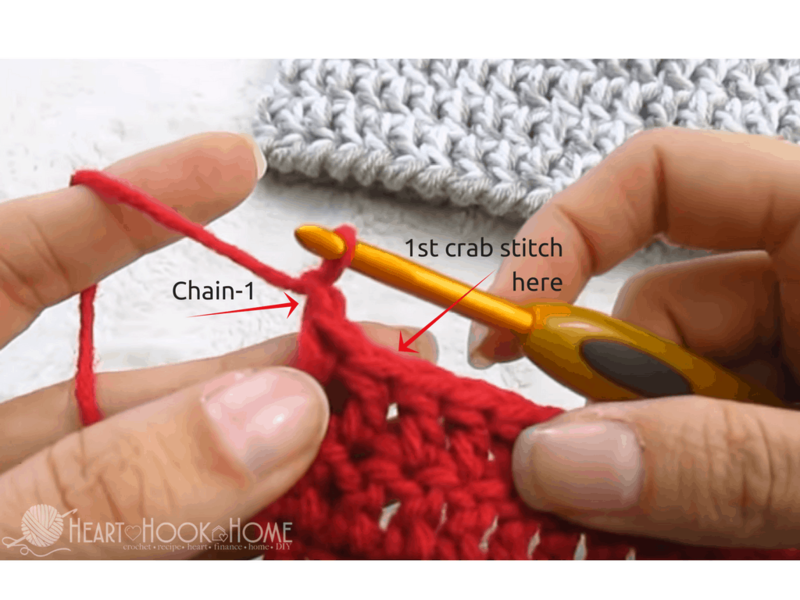 Treat this stitch exactly like a single crochet, except that you are working into the stitch to the RIGHT of your hook (not the left). To start the row, chain one and insert hook into the next full stitch to the right. (see photo) Pull up a loop. Yarn over and pull through both loops on hook. First crab stitch (reverse single crochet) made. Continue in the same manner around your entire piece, until you reach the beginning. Fasten off and weave your end in, blending into the first crab stitch of the row. 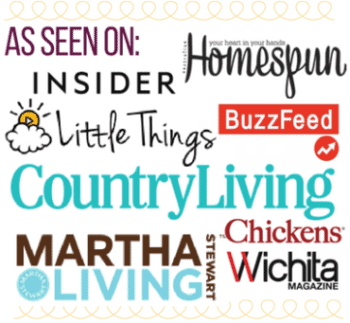 Ready to try it in real life? 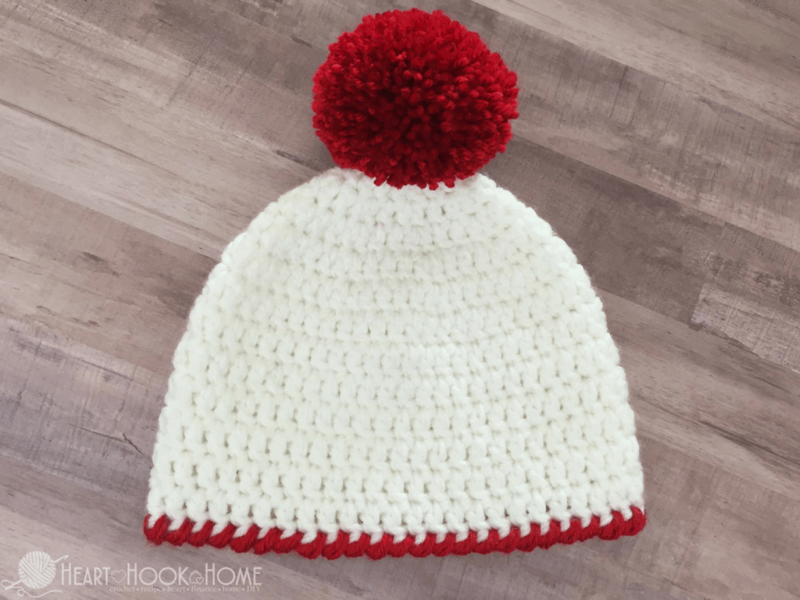 Use our Easy Peasy 30-Minute Beanie pattern! Iam a left handed crocheter and how does this stitch work for us folks, that are left handed? Hi Catherine! It's the same concept for left handers, just in reverse. So, you will be working single crochets from right to left. Hope this helps! I'm so glad! It is one of my favorites also. I made a beanie in red and black, and I'd like to do the crab stitch in just black. How do you start it with a different color? Thank you so much for the crab stitch video. Only yesterday I asked what a reverse stitch was, as I had read it as part of a beanie hat pattern, and now you have given me the answer. I am so grateful and can't wait to try it out. How many stitches would you do in corners of a blanket? When I learned this stitch 40 years ago it was called the pie crust stitch. I like the name better than crab stitch. Pie crust describes it perfectly. It is a beautiful edge! 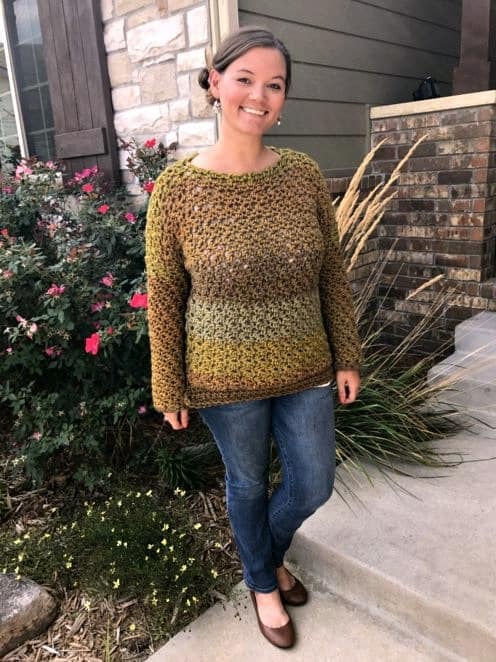 Thank you so much For sharing this pattern' I just finished the 30 minute hat. I made a child's hat using a smaller needle, I am going to use picot edging to give it a different look. Again thank you for sharing. I do not do hats to sell. Great instruction video! I like this stitch but it feels so awkward. I agree that it makes an excellent finish edge but it can be used for more than that. I first learned this stitch from an old pattern from Godey's for a baby blanket that has you alternate rows of half-double crochet and crab stitch (in the front loop) without ever turning your work. I've also used crab stitch to join crochet panels together for a raised rib design. Thanks for your suggestions they also sound great, like the alternating rows and JOINING great idea.